Astronomers and planetary scientists have been waiting with bated breath for the first detailed close-up images of Ceres, the solar system’s largest asteroid. Now, with NASA’s Dawn spacecraft approaching closer each day, tantalising new colour imagery has revealed new details of the geological processes that formed Ceres. Orbiting the sun between Mars and Jupiter, Ceres is also given the somewhat controversial classification “dwarf planet”. The Dawn spacecraft eased into orbit around Ceres a few weeks ago, and has since then been slowly circling across the dark, night-side of Ceres away from the sun. As the spacecraft begins to creep within sight of the day-side of Ceres, we wait for more detailed images of the “white spots” and other intriguing features seen during the spacecraft’s initial approach. Ceres measures nearly 1,000km across its equator, massive enough for it to have been pulled into a rough sphere by the force of its own gravity. This is made somewhat easier by roughly a quarter of its outer portion comprising of ice, whereas its interior is rocky. Is Ceres’ icy shell solid all the way down to the rock, or have lower layers of the ice melted to produce the sort of internal ocean known to exist within some of the icy satellites of Jupiter (Europa) and Saturn (Enceladus)? If there is an internal ocean, this could account for plumes of water vapour seen venting from Ceres last year by the Herschel space telescope – not to mention those mysterious white spots seen on the Ceres’ surface. A Ceres of images taken by Dawn during its approach. White spots, possibly water vapour plumes, can be glimpsed in the 2nd and 3rd images. Dawn has also taken colour images, now released, of Ceres as it approached. The colour images are formed by combining data recorded through three different colour filters in Dawn’s camera: blue, green, and near-infrared. These three channels, displayed as blue, green and red and amplified a little, look much like what human eyes would see if we were able to see a little beyond the red end of the spectrum. A colour map made of Ceres has been created by stitching together a series of images taken as Ceres rotated underneath the spacecraft, as seen in the main image above. The colours are different to the image released by NASA as the channels have been rearranged to match natural RGB more closely. The detail and colour from the images reveal many variations across the surface of Ceres. 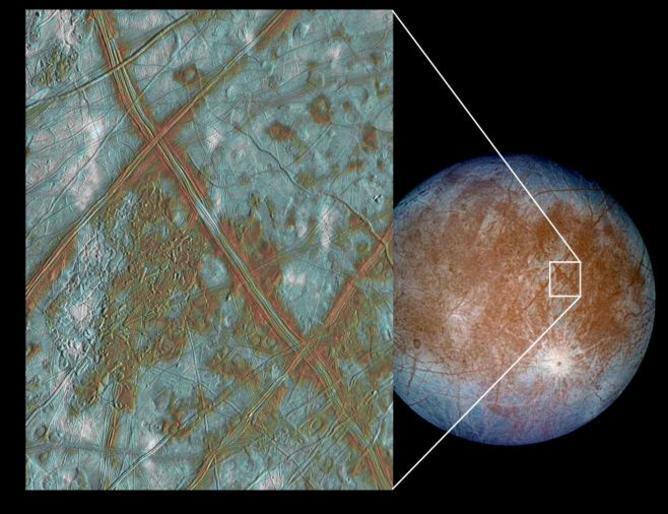 What is probably relatively pure or clean ice appears blue, whereas areas contaminated by rocky or carbonaceous material appear relatively red, as in this image of Europa. Jupiter’s moon Europa, showing relatively pure ice in blue and rocky or contaminated ice in red. Within weeks Dawn will reach its final orbit distance of around 250km from the surface, and we’ll start seeing Ceres, bathed in the light, in much greater detail.